Ground beef tostadas are a quick and easy recipe to make for a nice family dinner. This recipe calls for a meat-based filling that you can make ahead of time and freeze. To thaw, just let the meat stand in the fridge overnight and then reheat in a saucepan. Tostadas are a crisp flour tortilla topped with a seasoned meat mixture, then just about every topping you can think of. 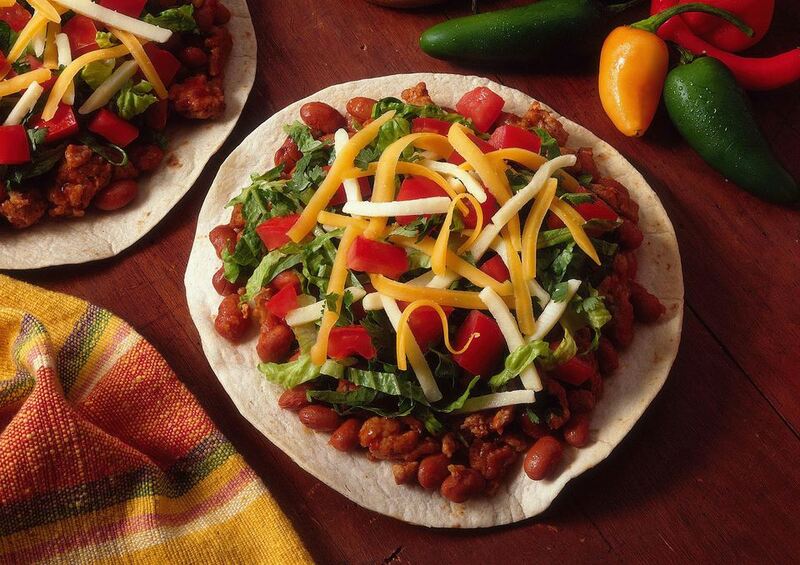 Classic toppings include chopped fresh vegetables, sour cream, shredded cheese, guacamole, and salsa. Making tostadas for dinner provides a nice alternative to tacos, which can become a weekly standby in some households. It's the same flavors and types of ingredients, but in a new format, which may appeal to finicky kids. Prepare the tostada shells according to the package, or make your own. Heat the beans in a small saucepan over low heat, stirring frequently. While the beans simmer, prepare the remaining topping ingredients. Put the tomatoes, sour cream, avocados, salsa, and shredded cheese in different serving bowls, and put them on the table. Let diners assemble their own tostadas, starting with the shell, adding a thin layer of refried beans, then the ground beef filling, and remaining ingredients. Eat at once! You can buy tostada shells in the refrigerated section of the supermarket. Some may be shelf-stable and available in the Mexican foods aisle. Or, you can make your own by frying flour tortillas until they are puffed and crisp. Drain them on paper towels and top with the rich filling and toppings. The tostada shells can also be baked. This recipe is also fun for a party too. Each person can customize his or her tostada to a personal liking. If you are feeding a crowd, consider making a few different proteins, like ground pork and ground sausage to provide some additional choices. If there are any leftovers, store all the ingredients in sealed containers in the refrigerator. Any broken tostada shells can be incorporated with the rest of the ingredients into a tasty taco salad the next day. You could make this recipe with ground turkey or chicken if you'd like, or substitute ground pork or ground pork sausage for the ground beef in the filling recipe. You can also substitute the meat with refried beans. This dish can be as mild or spicy as you'd like, depending on the type of salsa and spices you use.